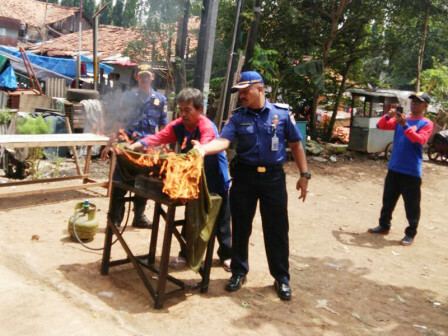 Around 50 residents at RW 14, Cililitan Urban Village, Kramat Jati, East Jakarta participate in fire handling training. Residents are expected to be more aware thus fire cases could be reduced.
" Socialization is done in densely populated area with semi-permanent building"
East Jakarta Gulkarmat Sub-dept. 's Fire Prevention Section Head, Edi Parwoko stated, there was fire incident in that place seven years ago. That location is also categorized as a densely populated area. "Socialization is done in densely populated area with semi-permanent building," he informed, Tuesday (9/4). Residents are seems very enthusiastic in this fire handling training since it is the first time they get this training. Participants are educated about fire hazard and techniques to prevent and handle it. Moreover, participants also try to extinguish fire on gas stove that is still on using wet towel and fire extinguisher.